Mom's Choice Awards 2014 Silver Award Recipient: Friendships With The Heart, illustrated by Michele C. Barnes, is a presentation of some pretty remarkable friendships. The people and four-legged creatures that I have written about in this book have plenty in common – they all are very special and they accept one another with unconditional love and care. It has been possible for them to celebrate the joyous times together and in turn...find the strength to sustain the challenges that perhaps may have come their way. 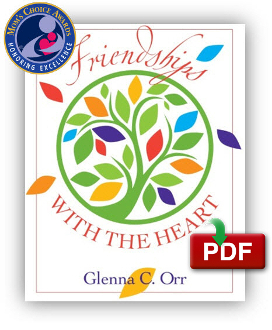 My special friends in this collection of stories share the common threads of compassion and trust – they educate, care for, and protect each other's hearts. Friendships give us laughter and comfort – the encouragement and the freedom to be ourselves. Copyright © 2014-2019 The Kind Kids, Inc 501 (c) 3 Organization. All rights reserved.